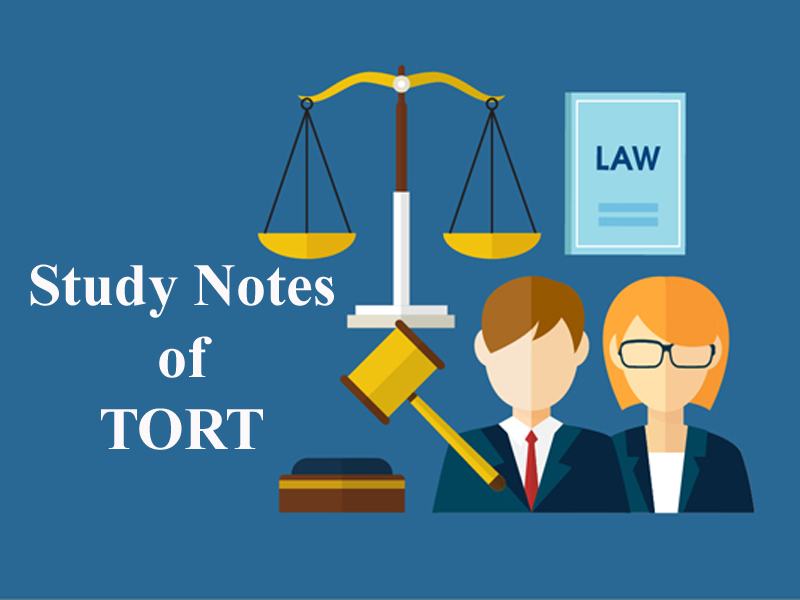 Here we are providing you updated and most relevant Study notes on Tort of Vicarious Liability for Law Entrance Exam. These study notes are highly recommendable for all those who aspire to crack CLAT, DULLB, AILET and other Law Entrance Exam. As a general rule a person is liable for the wrongful acts committed by him but in certain relationships the person may be liable for the wrongful acts committed by others. This principle/rule of making other’s liable for the wrongful conduct of the other is called vicarious liability. “Qui facit per alium facit per se” i.e. who does an act through another is deemed in law to do it himself. When an act is authorized by the principal and is done by the agent both are liable. The liability of master and servant is joint and several. The liability also arises even if no express authority was given by the master/ principal. 1 1. The wrong should be committed by a person working in the capacity of servant. 2. The Tort should have been committed during the course of his employment. The vicarious liability may arise in following relationship. 1 1. Master and servant. 2. Owner and independent contractor. 4. Company and its directors. The respondent, Mrs. Shyama Devi, opened a Savings Bank Account with plaintiff’s predecessor (Imperial Bank of India) at its Allahabad Branch. The respondents gave some cash and a cheque to one Kapil Dew Shukla, who was a friend of the respondent’s husband and employed in the said bank, for being deposited in her account. The said payments were made to Kapil Dew Shukla in his capacity as the respondent’s husband’s friend. No receipt or voucher was obtained indicating the said deposit. The Bank’s servant, instead of making the deposits in the respondent’s account, got the cheque cashed and misappropriated the amount. He, however, made false entries in the respondent’s Pass Book and Bank’s ledgers. It was held by the Supreme Court that the servant had acted outside the course of employment and appellant bank could not be made liable for the fraud committed by its servant. Who is Servant – A Person who acts and do work under the control & super vision of some other person. If a servant does a wrongful act in the course of his employment, the master is liable along with the servant. Thus, the wrongful act of the servant is deemed to be the act of the master as well. This is based on the doctrine “Respondent Superior” – Let the principal be liable. The liability of a master is not limited only to the acts, which he expressly authorizes to be done but he is also liable for torts committed by his servant on his own accord in the course of employment. 1. Fraud of Servant: When a servant, while in the course of performance of his duties, commits a fraud, the master would be liable for the same. Ms. Lloyds approached M/s. Grace Smith and Co. to seek investment related advice. The clerk who attended upon her asked her to sell her properties and then re-invest the proceeds. Ms. Lloyd signed certain documents, which were supposed to be sale deed. Actually, it turned out to be gift deed in favour of the clerk. The clerk disposed the property and misappropriated the funds. It was held that the company was liable for the fraudulent acts of the clerk. 2.Theft by Servant: If a servant steals goods entrusted to his master, the master is liable to the plaintiff. CASE LAW: Morris Vs CW. Martin & Sons Ltd. The defendant was running a dry cleaning services. A fur coat entrusted to him for dry cleaning was stolen by one of the servants of the company. Held, the defendant was liable for the theft of the servant. 3.Mistake of Servant: Where a servant, acting on behalf of his master, makes a mistake, causing loss to the plaintiff, the master will be liable for the same. CASE LAW: Bayley Vs Manchester, Sheffield. A railway company appointed porters to assist passengers to board the right trains. One passenger had got into the right train, The porter pulled him out and put him in another train. Held, the railway company was liable for the mistake of the servant. 4. Negligence of Servant: If a servant acts negligently in the performance of his duties or displays reckless behaviour, thereby causing loss to the plaintiff, the master would be liable for the same. ‘A’, a driver of a petrol tanker, was B’s servant. While transferring petrol from a lorry to an underground tank, he struck a match to light a cigarette and carelessly threw it on the floor. This resulted in a fire and damaged the petrol bank. Held that master was liable for the servant’s negligent manner of doing his work. 5. Wrongful Delegation of Duties: If a servant negligently delegates his authority and allows it to be performed by another person, the master will be liable for such negligence of the servant. The driver of a bus asked the conductor to drive the bus. The conductor drove the bus negligently and knocked down a pedestrian. Here, the master was liable for the negligent delegation of work by the driver. 1) In case where loss/ damage arises without the actual fault or knowledge of the master. CASE LAW: Beard Vs London General Omnibus Co. The driver of a bus had gone to have his dinner, leaving the bus in the custody of the conductor who decided to turn the bus to keep it in readiness for the return journey. While doing so, he negligently knocked down a passer by. Held, the master was not liable, as the conductor acted outside the course of his employment. 2) The servant does the act in defiance of express prohibition and the act is outside the course of employment. Case Law: Twine Vs Beans Express Ltd.
‘A’ provided a van for the use of a bank. He put up two notices on the van, which read that no unauthorized person is allowed to take a lift in the van. Also, that the driver had been expressly told not to give lift to outsiders. The driver nevertheless gave lift to an unauthorized person, who died in an accident caused by the driver’s negligence. Held that A was not liable, for the act of giving lift was outside the scope of employment. The court held that giving lift to an unauthorized person was not merely a wrongful mode of performing an act, but is a performance of an act of a category, for which the driver is not employed to perform at all. Sitaram the owner of a car had entrusted it to one Mohammad Yakub for plying it as taxi. The said driver appointed a cleaner. One day, the driver allowed the cleaner to use Sitaram’s car for the purpose of taking a driving test. While taking the test, the cleaner injured a spectator. It was held that the owner was not liable for he had not authorised the driver to employ strangers. Secondly, the cleaner at the time of the accident was not doing the master’s work. Thus the negligence of the servant took place outside the scope of employment. The trend of the decisions of various High Courts in India appears to have discarded the approach of the decision in the Twine case, referred to above. In other words, according to decisions given by various High Courts, giving lift to an unauthorized person by the driver makes the master vicariously liable. Hence students are advised to follow this trend in the examination. Thus, the master is to be held vicariously liable if the driver gives an unauthorized lift to a third party in the course of his employment. However if the driver gives lift to a third party by taking a new course of journey, not authorized by the master, the master is not liable. Sometimes, the employer may forbid his servant from doing certain acts. If the servant does the act in defiance of the prohibition, it does not mean that the act is outside the scope of employment. Thus the master is liable for such acts provided the act is done in the scope of employment. The owner of a bus had given express instructions not to overtake or race with other vehicles. The bus driver defying the instructions, overtook another bus, and in the process caused an accident. However the bus owner was held liable for the negligence of the driver. The driver’s negligence indeed took place within the scope of employment. 3) Where the servant is temporarily lent to another person, master may not be liable for the acts of the servant, if the temporary master exercises control and superintendence over the servant. Case Law: Mersey Docks & Harbour Board Vs Coqqins & Griffith Ltd.
A stevedoring company hired a crane, from a Harbour Board along with the services of a crane driver, on rolls with the Harbour board. While unloading cargo for the stevedoring company, the driver negligently injured a person. Held that it was the Harbour Board, which was liable to X. Generally, the employer is not liable for the torts committed by an independent contractor employed by him. However, this rule has some noted exceptions, where an employer can be made liable for the wrongs of the independent contractor. b) The employer’s liability arises for the dangers caused on or near the highway. A person got a lamp fixed on the outside of his house through on independent contractor. The lamp, which was negligently fixed, was over hanging on the footway adjoining the person’s house. It fell down and injured a passerby. It was held that the person who got the lamp fixed was liable for he has a duty to see that the job was properly done. c) An employer is liable for the act of an independent contractor in cases of strict liability. The owner of a mill, employed a contractor to construct a reservoir on his land to provide water to his mill. While digging, the contractor failed to notice some disused shafts beneath the ground and as such, did not block them up. Thereafter, he filled the reservoir with water. That night, the water broke through some of the shafts and flooded the neighbour, Y’s mine. The court held that X was liable for the damage caused to Y, even though the damage could not be attributed to his negligence. You can also try the following Practise question. 4. The vicarious liability may arise in following relationship. B. Owner and independent contractor. 5. If the employee of the bank takes a cheque from a neighbour who is a customer of the bank and misappropriates it. Will the bank be held liable? 10. A servant, acting on behalf of his master, makes a mistake, causing loss to the plaintiff, will the master will be liable for the same? 11. If a servant negligently delegates his authority and allows it to be performed by another person, will the master be liable for such negligence of the servant? 13. If the servant does the act in defiance of the prohibition, will the master be liable? 14. The owner of a bus had given express instructions not to overtake or race with other vehicles. The bus driver defying the instructions, overtook another bus, and in the process caused an accident. Will the owner be held liable? 15. Generally, will the employer be liable for the torts committed by an independent contractor employed by him? 16. What are the exceptions where an employer can be made liable for the wrongs of the independent contractor? 17. The defendant was running a dry cleaning services. A fur coat entrusted to him for dry cleaning was stolen by one of the servants of the company. Will the defendant be liable? 18. Will an employer be liable for the act of an independent contractor in cases of strict liability? 19. The owner of a mill employed a contractor to construct a reservoir on his land to provide water to his mill. While digging, the contractor failed to notice some disused shafts beneath the ground and as such, did not block them up. That night, the water broke through some of the shafts and flooded the neighbour, Y’s mine. Will the owner be held liable? 20. In India does giving lift to an unauthorized person by the driver makes the master vicariously liable. Keep Visting Clear Law Entrance. Get the updated and most relevant study notes on Vicarious Liability for upcoming CLAT and other Law Entrance Examination.